I am continuing on my journey of compiling my almost 9 years of teaching resources to create my complete high school art curriculum. So far, I have my Introduction to Art, Painting, Advanced 2D or AP Art Breadth, and now my Introduction to Sculpture and Ceramics curriculums complete. This leaves drawing (which I am currently compiling), 3D Design II, Advanced 3D Design, and a yearlong AP Art curriculum. Once I have all the courses covered, I will create one mass bundle pack for my Teachers Pay Teachers store. 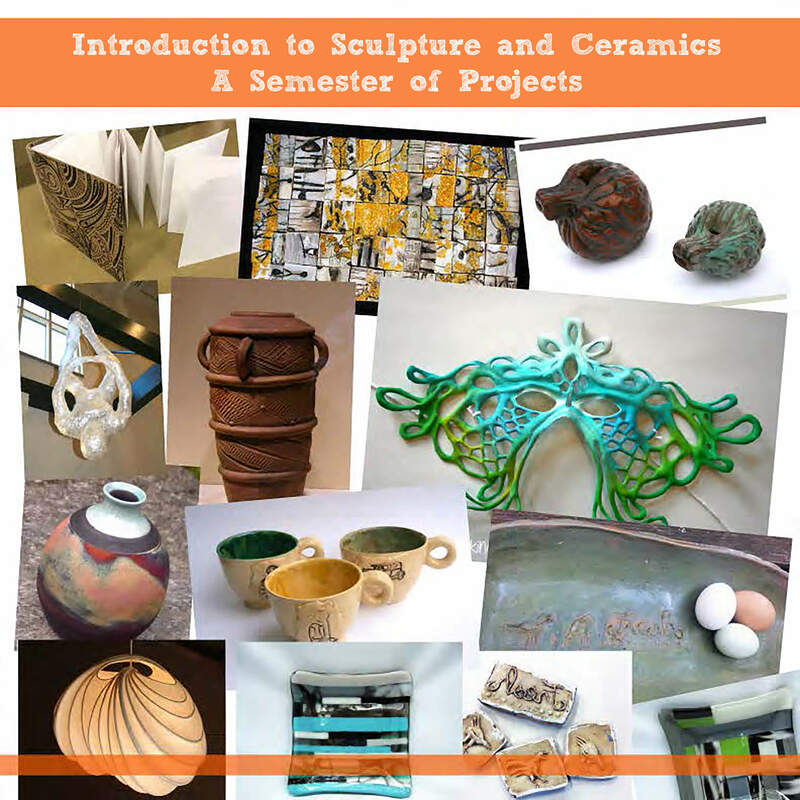 I am excited to have my sculpture and ceramics curriculum finally up. I taught the class for 5 years, between two schools and two very different looking art budgets. At my current, fancy private school job I had a large budget for my class. It was an appropriate amount in order to properly teach my students both sculpture and ceramics, which both require a range of expensive materials and equipment. I never felt like I was able to do the course justice it my last school, but I felt I could develop a well rounded curriculum here. During the semester students are introduced to clay, mixed media, leather, glass fusing, installation art, and tissue paper sculpture through 8 projects. They learn a variety of build techniques with clay, including pinch pots, slab building, coils, and using the pottery wheel. 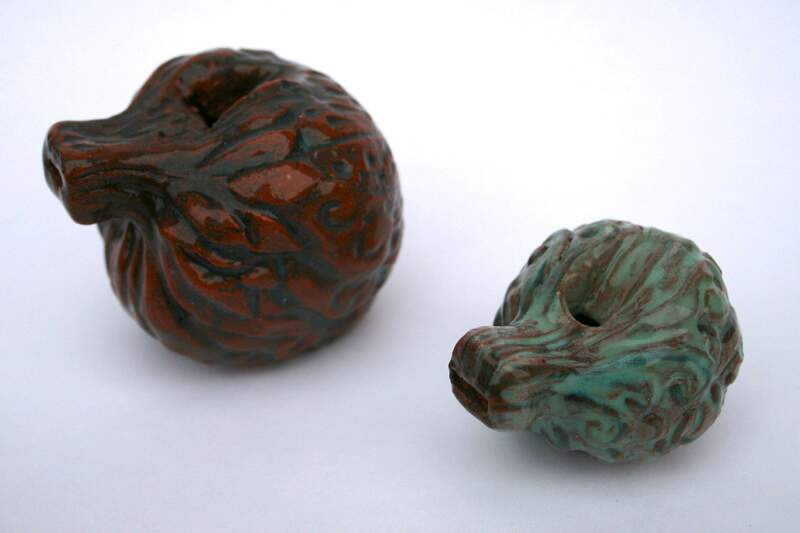 In addition to building with clay, they are also introduced to high, low and raku firing techniques. On the sculpture side of things they learn about installation art, by creating a packaging tape person, mask making, using leather, mold making, using clay and plaster, light sculpture, using tissue paper and reed, and glass fusing. With all of my projects I like to start with a PowerPoint. I include a piece of art history, artist exemplars, project examples, step by step instructions, and a breakdown of my project expectations and grading. 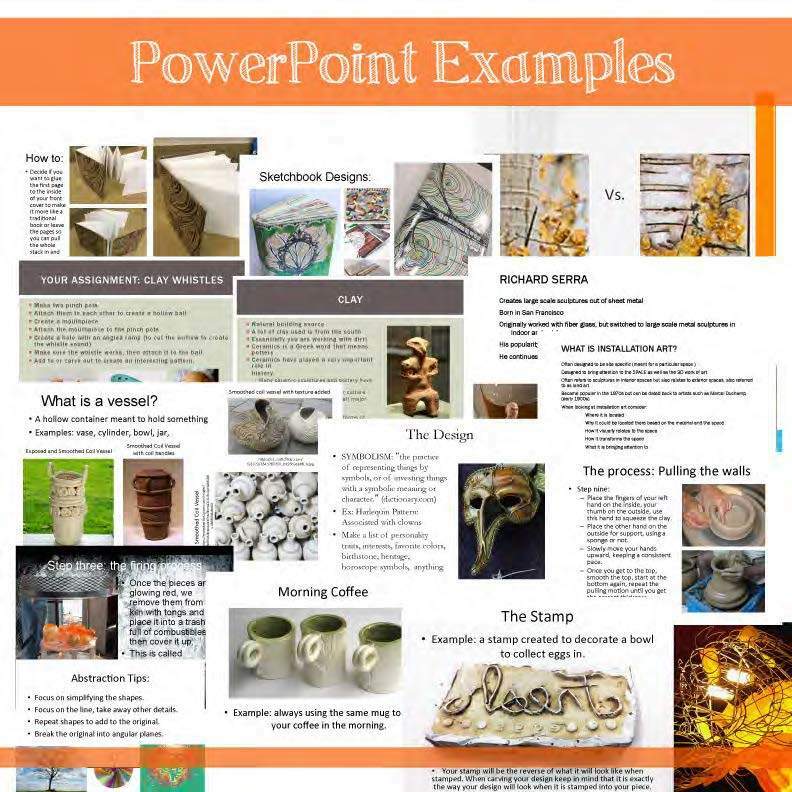 This curriculum pack has a PowerPoint with every project for a total of 13 PowerPoints. I include my PowerPoints on my class blog, that way if students miss a project introduction they can look through the slides themselves. In addition to having a PowerPoint with every project, I also have a lesson plan, which includes big ideas, objectives, vocabulary, supply list, and step by step instructions. 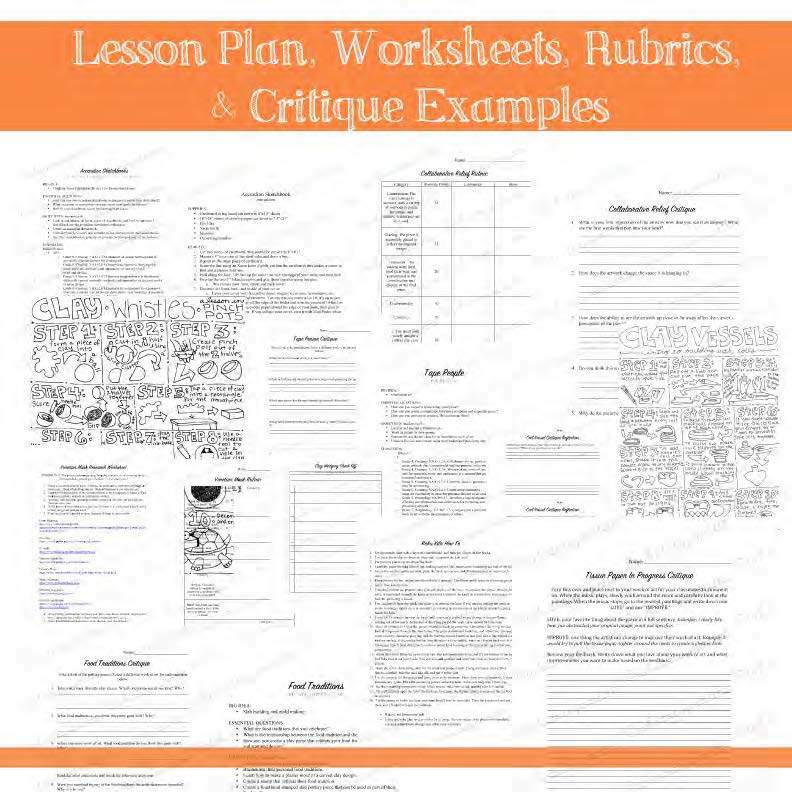 In this curriculum I have a rubric for every major project, checklists for smaller assignments, as well as critique sheets, research worksheets, and how to handouts. I have resources to help guide my students through every assignment. I hope this can help someone get started with a new year of teaching, new class, or just a set of fresh ideas. Thanks for taking the time to check out my blog! Help me spread the word by sharing with others. Visit my TPT store here. These last few weeks have been a blur of late afternoons, clay, pottery wheels, handmade ceramic pieces, glaze, encaustic wax, and glass. My recent decision to join the newest addition to the Atlanta retail scene, Crafted Westside, meant I needed to produce pottery. My long afternoons began, my second job as working artist started as soon as my first job, art teacher, ended for the day. 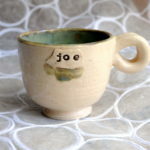 Every day I stay pumping out decorative bowls, teapots, pitchers, and mugs. 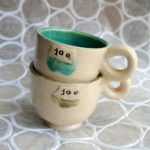 I love seeing the similar glaze colors coating each pot create a unified, body of work. I don’t think I have ever made so much pottery. As I begin each creation I try to think like a consumer. Who will buy my products? What is their taste? What will compliment the overall look of the shop? Generally the consumer I visualize is me, shopping for my Mom on Mother’s Day, my sister for Christmas. 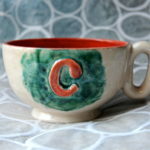 When it came time to create my “c” alphabet mug, I couldn’t help but include a coral shade, after all my sister Christy is a bright, pink personality. 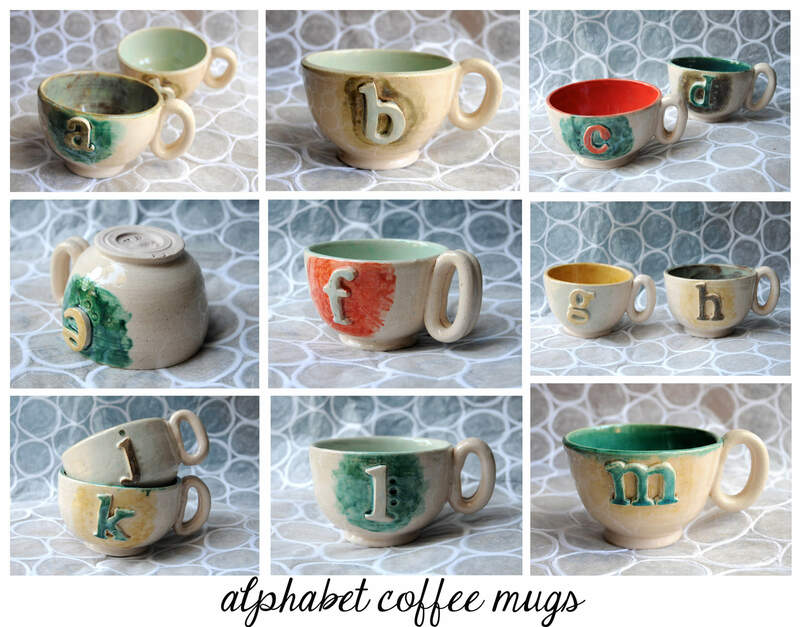 My goal in the coming weeks is to complete the entire alphabet in mug form. 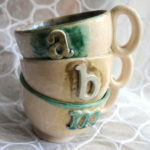 I am currently up to letter m, with letters n-u waiting to be fired and glazed, and letters v-z waiting to come into reality via my B mix clay and pottery wheel. 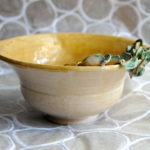 In addition to the many mugs I have created in the past few weeks, I have also been hard at work creating more decorative bowls. My house is scattered with ceramic bowls. If a tabletop looks empty, I plop a bowl down to jazz it up. I love crisp white contrasting with a bright interior. Over the years I have developed a knack for making flowers out of clay. A pinch here, a pinch there, a score and a slip, and out comes a hydrangea, rose, or camellia. Just this week I added a dot bowl and a hydrangea to the mix at Crafted Westside. 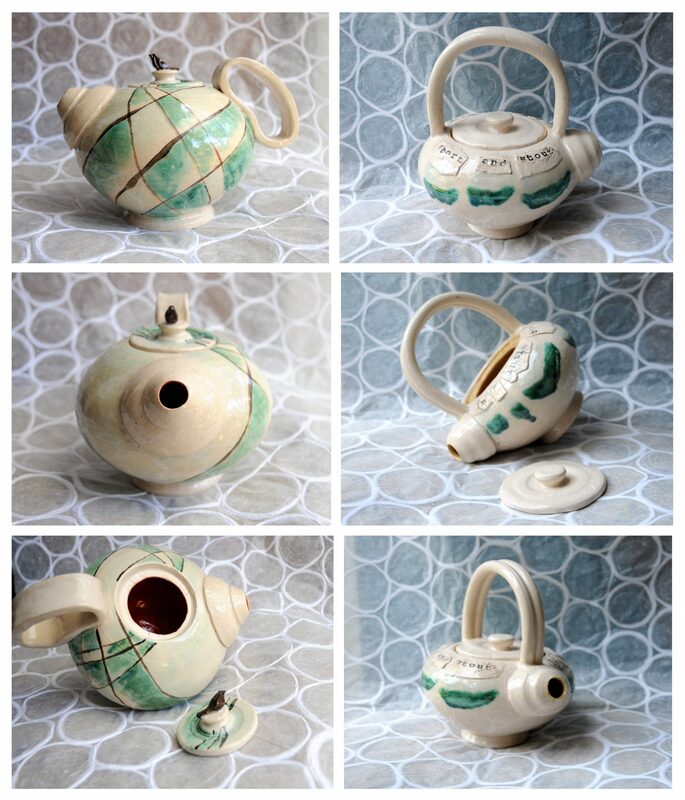 My absolute favorite thing to make on the pottery wheel has to be teapots. 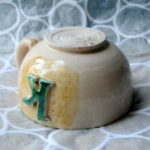 There is something about seeing the spout, lid, and handle come together that makes me smile. I knew I wanted to add a couple of teapots to the shelves of Crafted. Luckily, at the time I was also about to begin a teapot lesson in my 3D II class. 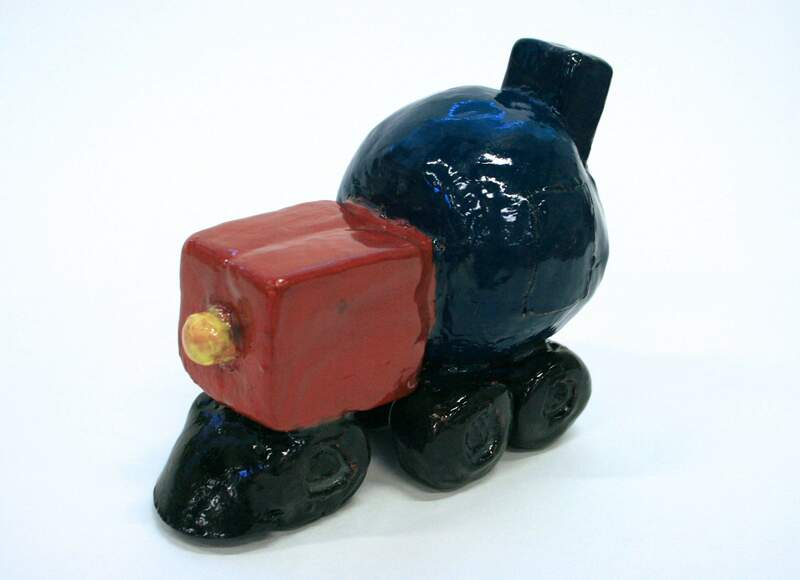 It was the perfect opportunity to kill two birds with one stone; demonstrate how to make a teapot to my students, and create a teapot I could turn around and sell. First came my bird teapot. 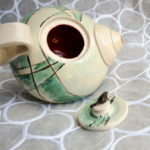 I want to create a small bird to serve as the handle of my teapot lid. After some brainstorming I decided to go a more abstract route when glazing, and drew lines to represent telephone lines, and glazed in between the lines. The end result almost looked like a plaid shirt wrapped around my little teapot. When you first take a glance at it, it looks like a random pattern. But, when you give it a closer look the telephone lines and bird silhouette begin to emerge. 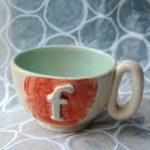 For the second teapot I opted to stick with a stamped letter design, which was already incorporated into a handful of mugs and bowls at the shop. 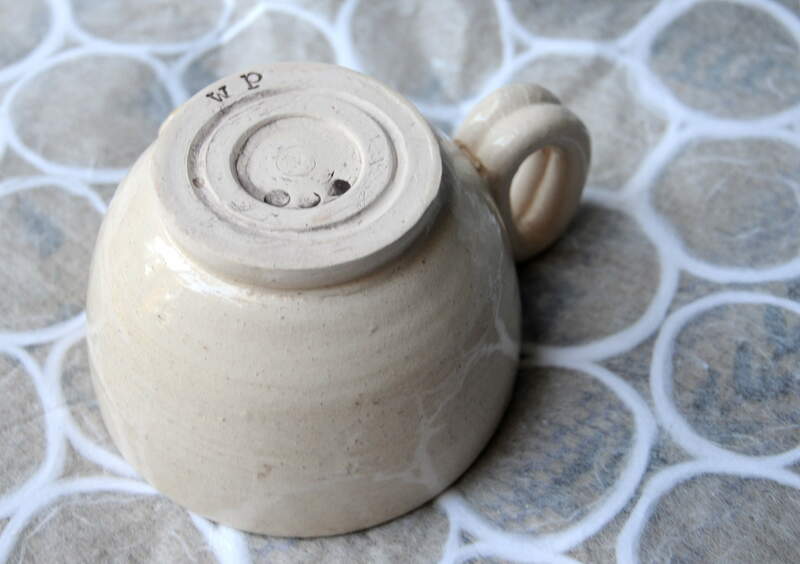 I put my teapot together, and thought about what to stamp into it. 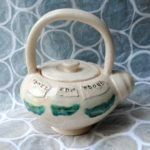 After looking at my small little pot, I decided the perfect quote is from the childhood song, “I’m a little teapot, short and stout.” It was perfect, it was nostalgic, and fit with the short and stout nature of my teapot. There is something about teapots. They each have their own personality. As I put them together I feel like I get to know them. The final addition to my space at Crafted Westside is my brand new business card holder. With the creation of my new identity, Sweet Celadon, came a need for advertisement and contact information in the form of business cards. 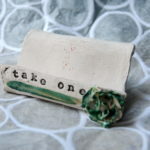 While I waited for my order to arrive I decided I needed a handmade ceramic item to hold my new cards. Out came this simple, flower and hand stamped card holder. I can’t wait to see my table at Crafted Westside continue to fill up. I hope in the coming weeks I continue to move items through the door and create new items to replace them. In addition to the handmade ceramics I have focused on for the shop, I have also been prepping for my next craft fair, the annual Wesleyan Artist Market, coming up May 1st-3rd. More information will come soon! Thanks for taking the time to check out my blog! Help me spread the word about the brand new shop, Crafted Westside, and my blog my sharing this post with others. At my previous school I always taught a lesson on the grid method by creating a collaborative grid with my students. Each student would get a section of the original image, and they had to enlarge and re-draw it. In order to accurately re-draw the image they had to pay attention to where lines and shapes intersected the outside edge of the image, which in turn taught them the basic concept of the grid method (read more about this here). In the process of changing schools I also changed my teaching title, which meant a lot of new lesson planning was ahead of me. I was now exclusively a sculpture teacher, teaching 3D I and 3D II classes. 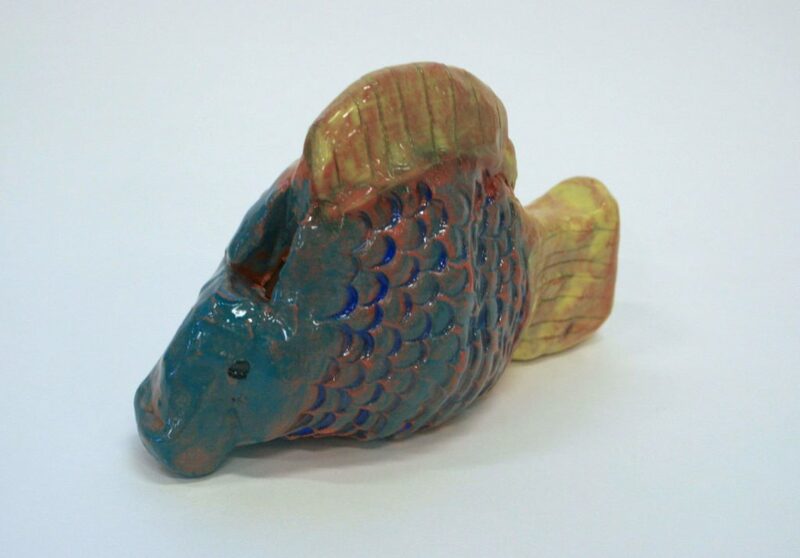 Although I had taught sculpture in the past, and spent a lot of time in ceramics class in high school and college, I felt a lot of pressure to re-create assignments, and think outside of the box. After all I was moving to a private school with an established and impressive art department, I felt I had big shoes to fill in my new work environment. Although it has been stressful at times trying to produce examples and create new projects, I have loved every minute of it. It truly is amazing how different a class can be when you actually have the budget to support it. I now had the ability to teach interesting, complex, and creative projects, without the fear of running out of supplies with no money left in my budget. As excited as I was to have a new challenge in my life, I did miss some of my old projects, including my Intro to Art collaborative grid assignment. One day while reminiscing on the past, as I often do, it dawned on me that I could do a collaborative grid project in sculpture, by focusing on relief carving. I had my doubts that everything would come together during the project, but once all of the pieces were in place, I couldn’t believe how amazing it looked. I am so proud of my students and I hope another sculpture teacher can find an interesting way to implement this into their class. OBJECTIVE: For students to learn the history and techniques of relief carving, and apply those techniques in a collaborative relief carving project. 1. I began this project by introducing my students to the artists, Brunelleschi and Ghiberti, and the famous Florence Baptistry doors competition. I had the students vote on which “Sacrafice of Isaac” relief they liked better, and we continued to discuss the doors as well as the Gates of Paradise doors. 2. After the history lesson I introduced the assignment. 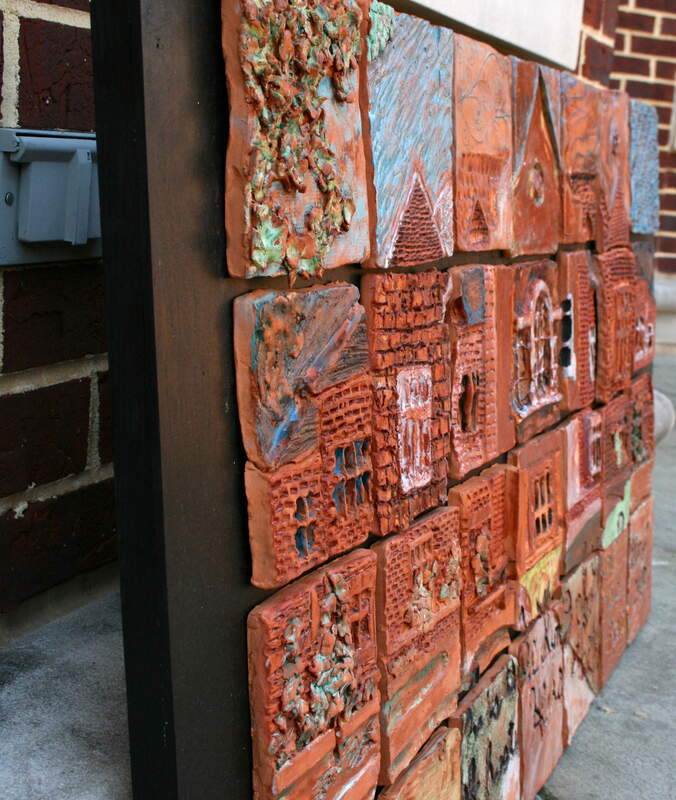 I explained that I would randomly hand out a 1″x1″ section of a larger image, and they would have to recreate it as a relief sculpture on a 6″x6″ clay slab. We discussed carving techniques and looked at the variety of tools they could use to create different textures. 3. After the assignment was explained they got to work. Before they started the project I had taken an image of our Fine Arts building, divided it into a grid, and put a number and letter on the back of each square (1A, 1B, 1C, etc.). I made sure to make a few copies, the students tend to misplace their squares and it helps to have extras on hand. As soon as the students got their slab square cut they had to flip it over and carve the letter and number into the back of it. 4. After the students completed their squares I fired them and had the students glaze them. I knew every line and shape would not line up in the image, so my goal was to create a sense of unity through the glaze. I instructed the students to loosely paint underglaze onto their tile (I set up a few colors of blue, green, brown, and red) allow it to dry, then wipe it off with a wet sponge. 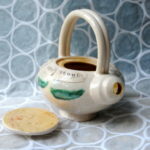 This technique caused the underglaze to stick in the textured areas, and wipe off of the smooth area, giving it a loosely painted quality. 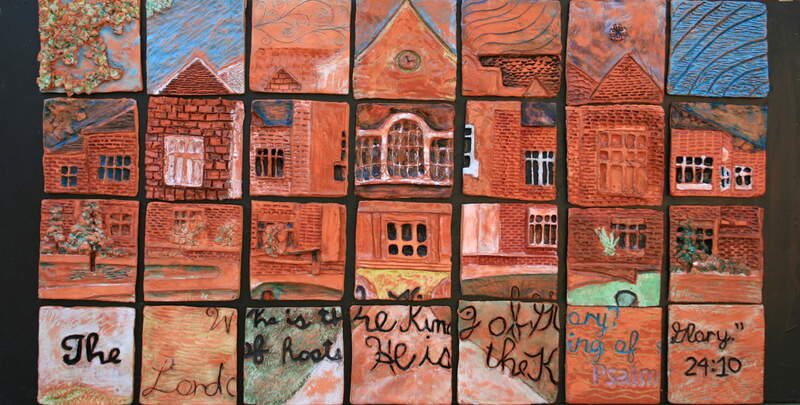 Once the colors were added they painted a layer of clear glaze on top, and once again wiped it off. I loved the shiny vs. matte look this created. 5. Once the pieces were fired a final time I glued them to a piece of wood I cut to size and painted black. My plan is to eventually add a black frame and display it in the Fine Arts Building. My students were as impressed as I was with the final product, and it was a huge hit at our annual art show. I love how each piece is important to the whole, and how it truly came together in the end. Thanks for visiting my blog, I hope you find useful information you can use in your classroom! Please comment if you have additional tips, ideas, or have done something similar in your class! Thanks for helping my spread the word about my blog by liking, tweeting, commenting, and subscribing! I couldn’t do it without you! 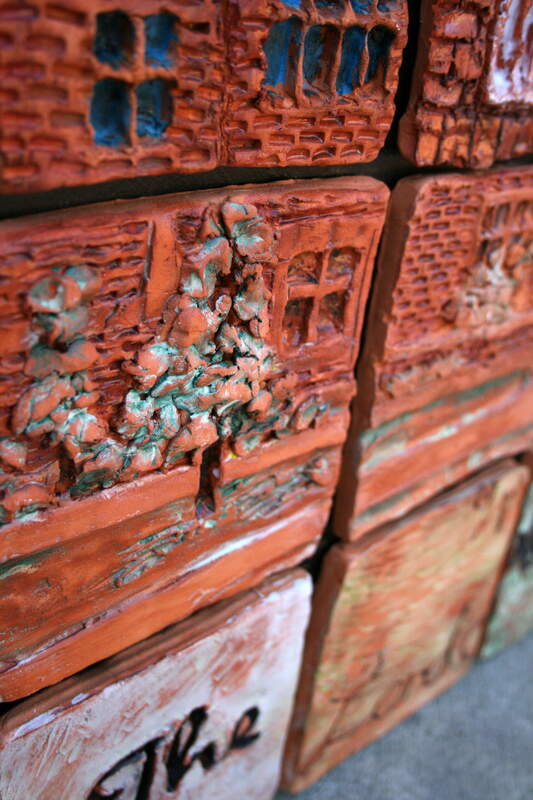 I recently found myself in a clay building mood, and clay boxes just happened to be on my lesson plan list. I figured, what better way to cure my artsy urge than to kill two birds with one stone, and create an example for my next lesson. I decided to make a set of three, the same shape and size, but with different decorating techniques. 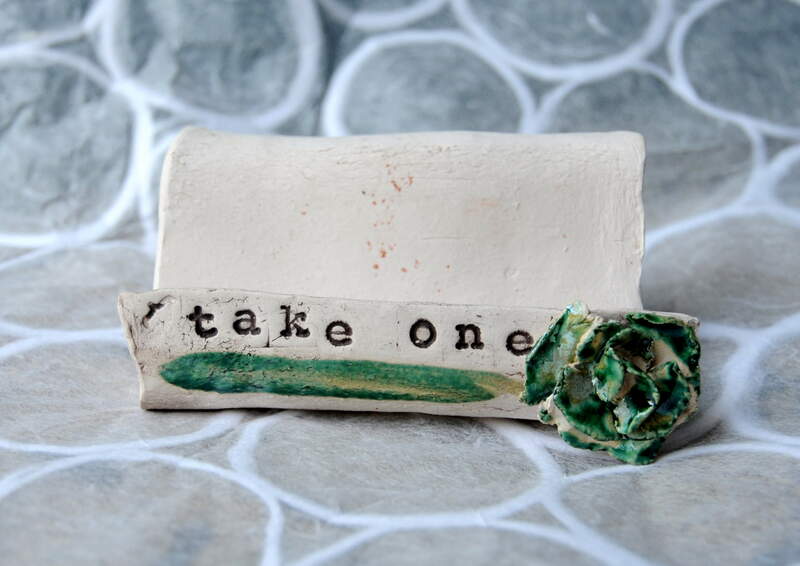 For a moment I considered listing customizable ceramic boxes on Etsy. Potential customers could request different initials and flowers to decorate their boxes, and they could be cute wedding related gifts. However, after making these three I was over constructing with clay for awhile. 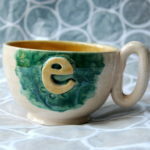 I guess I am still searching for my Etsy niche, I need something I have fun making, and won’t get sick of! The simplest of the three is the “W” box. I used white clay as a base, and pressed a piece of patterned rubber into the still damp clay before I put it together. Once it was pieced together I cut out a W letter, pressed the patterned rubber into it, and scored and slipped it onto the box. To emphasize the pattern I decided to loosely paint brown glaze on the box, then rub it of with a sponge. This left the glaze in the recessed areas of the pattern, but removed it from the raised areas. 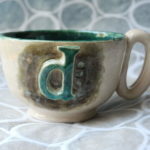 I repeated this process with blue glaze, then painted the W and interior with Tawny and blue glaze. The end result wasn’t what I expected, but it was a happy accident. I didn’t entirely wipe the glaze off of the raised areas, and the glaze ended up staining the white clay a pinkish color. This box is slightly more complex than the last, with the hand built flower on top. To create this piece I took burlap and lace, pressed them into the damp clay before I constructed it. 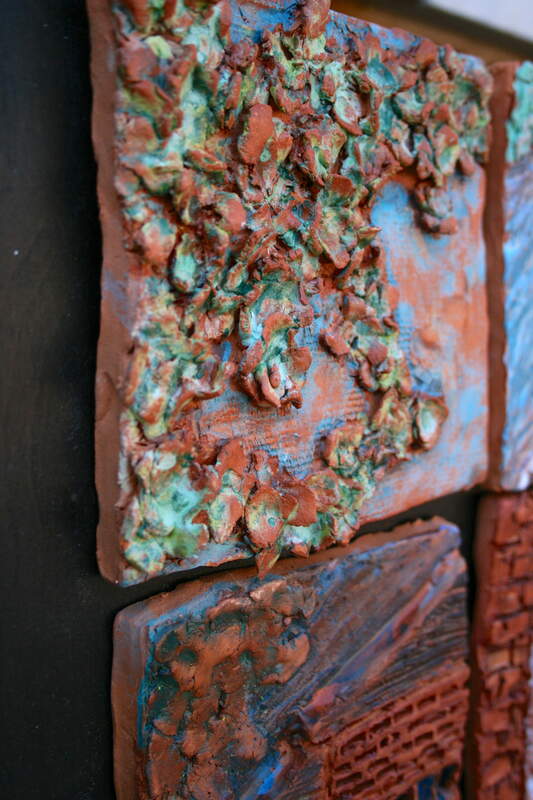 Once the box was pieced together I created a flower by layering flattened pieces of clay. 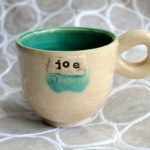 I used the same glazing technique as the “W” box, rubbing the glaze off after it was applied, but I added a thin layer of celadon glaze on top of the partially wiped away brown glaze. I used a coral color glaze to paint the flower and I painted the inside with celadon. This box combines the flower building and letter cutting technique into one. 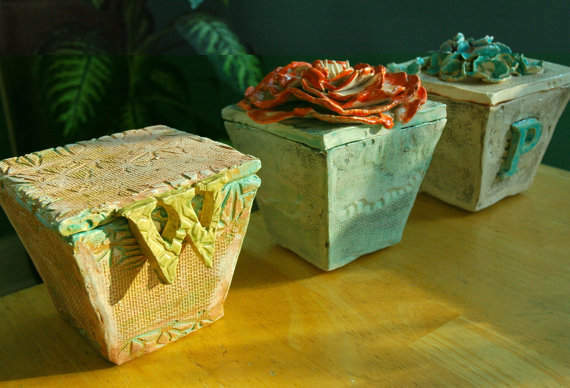 Like the other boxes I pressed burlap and lace onto the damp clay and used a dark brown glaze to emphasize the pattern. I clear glazed it, painted the interior with coral, and painted the “P” and hydrangeas with celadon glaze. 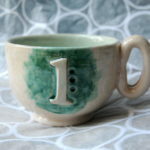 This is a fun project to do on your own, if you have access to clay and a kiln, or with students in an art class. I often teach box building because it covers template and slab building techniques. For design inspiration I have my students think of something they want to protect, tangible or intangible. They must create the shape and design to reflect that object. This is a lesson I will be teaching before the end of the semester, I hope to photograph the process and post the lesson in my “art lessons” section. If you are interested in seeing it, keep checking back! 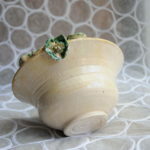 I hope you liked today’s post about my recent ceramic box building day. These three are available for purchase on my Etsy shop here. Thanks for stopping by and helping be spread the word about my blog! 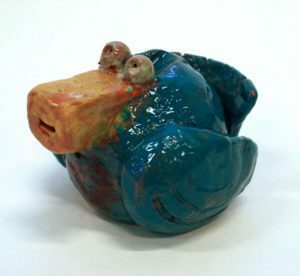 While I was in college one of the ceramics teachers did a clay whistle project with their class. When I heard about it I was bummed I wasn’t in his class, because it sounded like a fun project. However, after hearing all of the moaning and groaning from the students in his class about how difficult it was, I was thankful I wasn’t in his class, but the project still stuck with me. As a teacher I try to choose projects that will challenge my students, but still allow them to be successful at varying levels of ability. This is as difficult as it sounds, which is why it took me three years to gain the courage to try this project in my sculpture class. It all came together at the beginning of the school year when I was trying to map out my projects for the year. 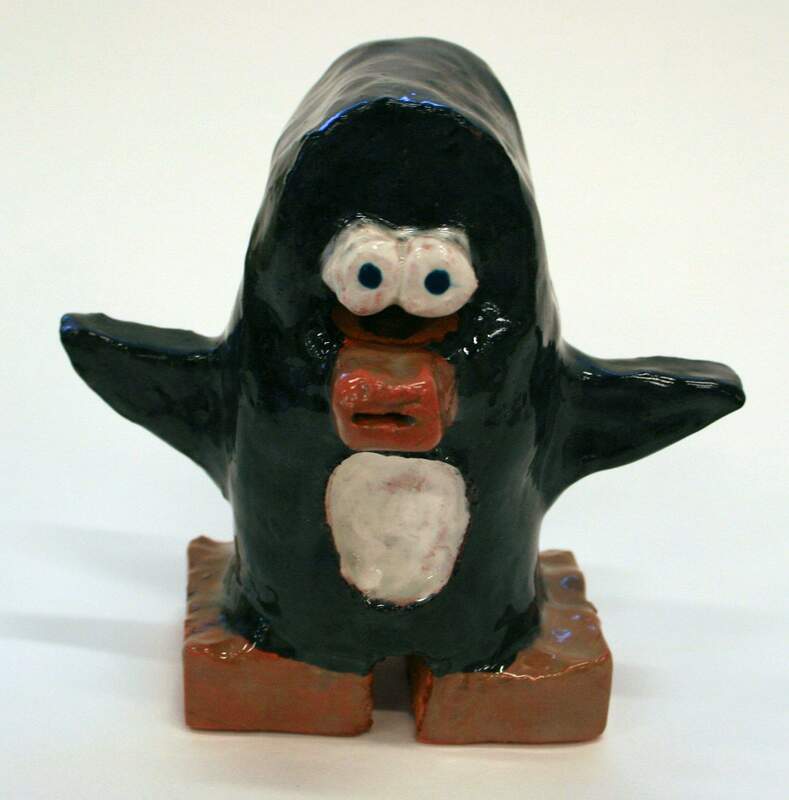 I was talking with the middle school art teacher about project ideas, who is very knowledgeable about clay. 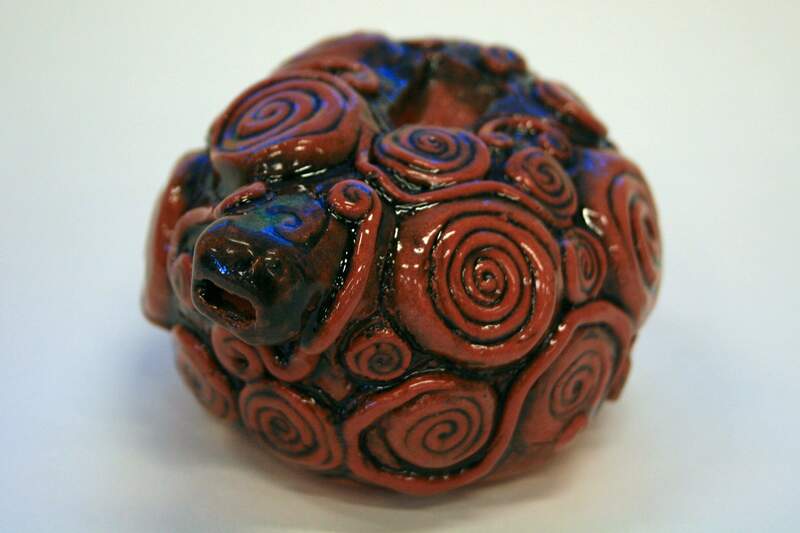 I was trying to come up with an introduction to clay project that would include pinching, slab rolling, and coiling techniques all in one. After chatting for a minute he made a good point, they are all important enough skills to focus on individually, and not skim over with one quick project. That solidified it for me. I would come up with a project specific to each technique, and what better pinch project than clay whistles? 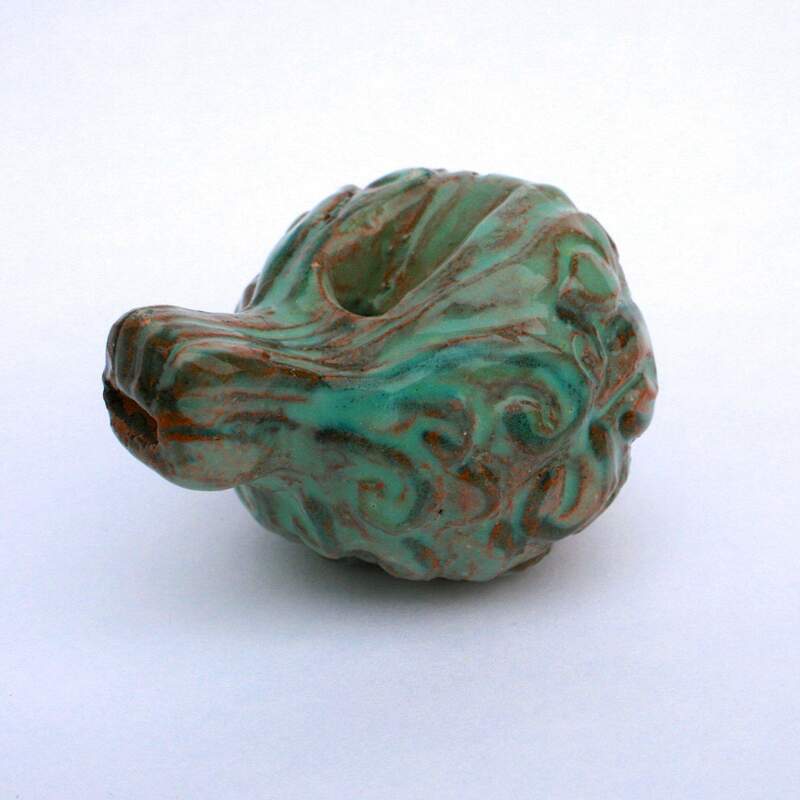 I took a deep breath and sat down with a pile of clay and began making my very first whistle, and it was hard. It took longer than I expected to get it to whistle, plus two failed versions in the trash. This youtube video ending up helping me get that first whistle working. The minute I heard the nice sweet sound my whistle produced, I was hooked! I started a second one just to make sure the first wasn’t a fluke. The second was quicker and even more successful. The whistle was clearer and deeper, it was perfect! Now it was time to introduce it to my students… I wasn’t sure how this was going to pan out. In the PowerPoint I also included images of the steps they would take to create their whistle, for this I relied heavily on this website which had great graphics of the steps(which also has other great lessons if you haven’t already discovered it!). I also printed the images out, made copies, and gave one to each student to reference while they made their whistle. In addition to going through the steps via photographs, I also did a demonstration after the PowerPoint. This may seem like a lot of repetition, but it helps the students to see it multiple ways before they try it out themselves. Once I was tired of talking I set the students out to create their whistles. 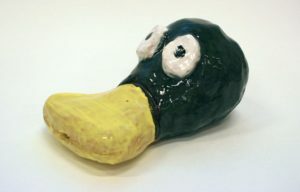 They all had to start with the basic round shape, but once they had a whistling whistle they could turn their shape into anything they wanted, as long as they included both additive and subtractive techniques (scoring and slipping something onto it and carving something out). They could do something more abstract, like my examples, or create an animal or object form, which a lot of the internet examples were. Whenever possible I like to have an opened assignment to allow my students to personalize their creation. They all have different tastes and interests, so why force them all turn their whistles into animals or patterns if they don’t want to? I was shocked at how quickly some of my students got their whistles to work. Others struggled, but I encouraged them to help each other out, and more often than not the finished early kids got the other students’ whistles whistling. At some point in time every students’ whistle worked. Once they began adding to their designs, sometimes their whistles stopped working, and it took adjusting to get it back again. I did have a couple that didn’t whistle by the time it was turned in, which cost them a few points, but the majority of them worked. If you do this assignment remind your kids to continuously check their whistle. 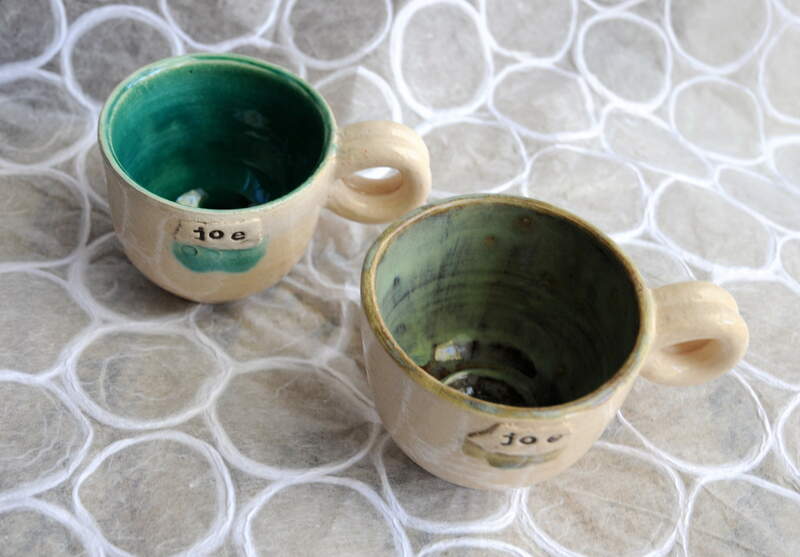 Once they were finished and dried out, we bisque fired them, then glazed them. I had everyone use underglazes for this first project, and we put a final coat of clear glaze on top to make them shiny. 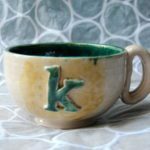 I chose underglaze to allow them to paint their creations with specific colors and patterns, that would stay put during the glaze firing process. When we were done we did a group critique, each student blew their whistle for the class, and we discussed the sound, design, and glazing techniques. Overall the students were really invested in this project. I cannot even express the sense of accomplishment they displayed when their whistle started working. It cracked me up to watch all of their heads jerk up every time another one found it’s sound! I will definitely be repeating this for my 3DI class in the spring! I apologize for the slightly dark images and not having any in progress images! I plan on being more diligent about photographing my students at work next semester. I hope you enjoy the post regardless, and I hope it helps you plan future assignments! Please share the love by liking, tweeting, sharing, e-mailing, subscribing, and commenting!